Clay Shannon couldn't get enough farm workers this year up to Lake County to pull leaves from his vines. So at Shannon Ridge, he's using sheep instead. 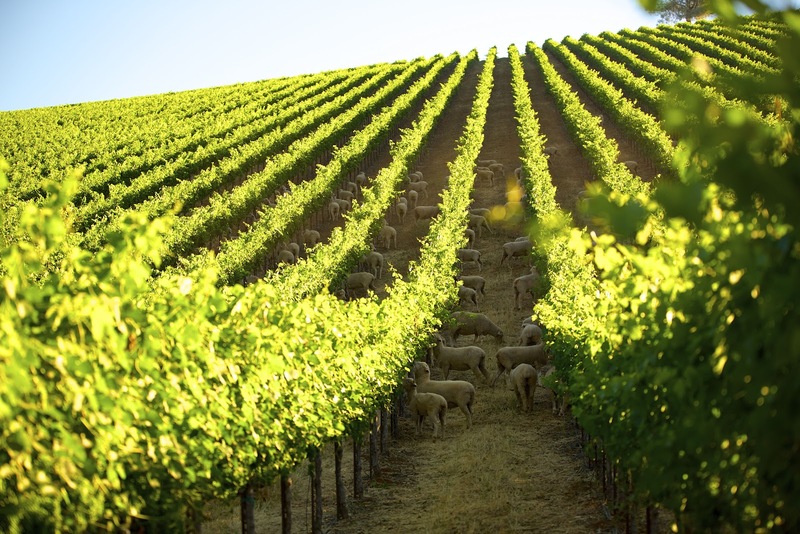 Many wineries have used sheep in vineyards to clear cover crop, especially at the beginning of the growing season. But Shannon might be the first to use sheep for leafing, which is generally considered semi-skilled work. "People have oils on their hands that affect the fruit. It's hard for even experienced workers to use shears without touching the berries," Shannon says. "The sheep put that soft muzzle on the fruit. There's no damage. After all, it's sheepskin." Shannon's sheep wranglers rope off a row of east-facing vines and let the sheep loose in them. When the job is done well enough, they move the ropes to another section. Sheepdogs herd the sheep from row to row. You'd think the sheep would also eat the small green grapes. I asked Shannon why they don't, and he invited me to try one. It was a little sour, but not bad really, and to me, a lot tastier than a leaf. "You're not a sheep," Shannon said. He says the leaves also have sugar in them, and just before veraison, where the grapes change color, the leaves have more sugar than the fruit. Plus they're high in protein. "These sheep are happy," he says. "When you add in the clover that's on the ground, it's the ultimate meal for them." Shannon started doing this because of the labor shortage, which is acute this year because of the impact of border controls on the Mexican workers who normally do most of the work in California's farms. "We have about 120 people working for us, but we need about 300," he says. But he's happy with the sheep's work. "They are doing in my opinion a better job than human beings would do," he said. One reason is that sheep don't just tear off the leaves and put them in a bin to be composted. They eat and digest them, and keep in mind they spend the whole day on Shannon's property. "Sheeps turn the leaves into fertilizer much more quickly than a compost heap," he says. Shannon is originally from Healdsburg, and his family was in the sheep farming business when he was young. But until the labor shortage caused him to start using sheep to remove his cover crop two years ago, he hadn't worked with them as an adult. Now he has about 1000 sheep and he rents about 600 more, which means he gets a tasty byproduct that goes well with Shannon Ridge Cabernet -- lamb. "We sold 400 lambs to Niman Ranch this year," he says. "We sold about 100 lambs to auction, and we harvest 600 lambs ourselves and eat 'em or sell them out of the tasting room. You have to have a system to get rid of lambs, but that's my background. I'm comfortable with sheep." My column this month for Wine Review Online is about Lake County Cabernets, but there aren't any sheep in it. Read it here anyway. "Shannon's sheep wranglers rope off a row of east-facing vines and let the sheep loose in them." This will keep me up a night: east-facing rows also have west facing sides, so what's to keep a sheep that's grazing in-between rows from grazing the west facing side of the adjacent row (not to mention inconveniently grazing the developing clusters on both sides, as well as the leaves). To the idea of replacing the farm workers, I say baa!